The Mayfair - Vertical Single Designer Radiator has a beautifully simple design, with oval bars creating a subtle and elegant look. The modest widths of the Vertical allows for placement in settings which may have previously been overlooked. The Mayfair is available in 3 stunning finishes: White, Black and Anthracite. This is the Anthracite Version, for White click here, for Black click here. This is the White Version, for Black click here, for Anthracite click here. The Kensington - Double Flat Vertical Radiator - White has a lovely simple design, with flat panels running vertically, creating a sleek, and subtle look. Due to it's unobtrusive design, the Kensington would look great in any room in the house. This is for a Double Panel with blazing heat outputs, it is also available in a slimline Single Panel. The Kensington is part of the brand new The London Collection, a selection of quality radiators with amazing designs. The Mayfair - Horizontal Designer Single Radiator has a beautifully simple design, with oval bars creating a subtle and elegant look. This is for the horizontal model with vertical bars. Available in a Single or if you wanted increased heat outputs, then please see the Double Panel Mayfair, both with a tremendous 15 year guarantee. The Kensington - Single Flat Horizontal Radiator has a lovely simple design, with flat panels running horizontal creating a sleek, and subtle look. This is for a slimline Single Panel, it is also available in a blazing hot Double Panel. The Mayfair - Designer Towel Rail - Anthracite has a beautifully simple design, with oval bars creating a subtle and elegant look. This is for the Anthracite Version. The Kensington - Single Flat Radiator has a lovely simple design, with flat panels running vertically, creating a sleek, and subtle look. This is for a Single Panel, it is also available in Double Panel which gives additional blazing heat outputs. This is for the Black version. The Kensington is part of the brand new The London Collection, a selection of the best quality radiators with amazing designs. The Mayfair - Designer Towel Rail - Black has a beautifully simple design, with oval bars creating a subtle and elegant look. 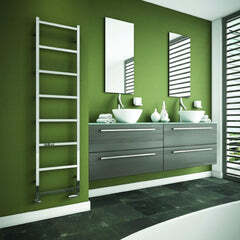 The Stratford Smooth Aluminium Towel Rail is a great towel radiator that will complete any modern bathroom. 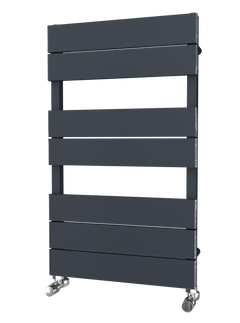 The light aluminium design of the radiator allows for an easy install but also some amazing heat outputs which makes it easy to dry towels but also heat a sizeable bathroom. Another benefit of Aluminium is they use lower water content to heat up, so can help reduce your heating bills. 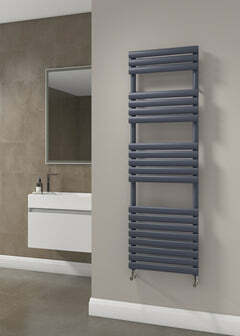 The Stratford comes in beautiful dark Anthracite allowing this radiator to fit with most bathroom styles. This is for the Anthracite finish. 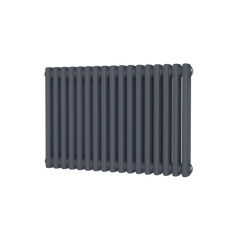 The Mayfair - Horizontal Double Designer Radiator has a beautifully simple design, with oval bars creating a subtle and elegant look. This is for the horizontal model with vertical bars. The Kensington - Double Flat Horizontal Radiator has a lovely simple design, with flat panels running vertically creating a sleek, and subtle look. Due to the subtle design, the Kensington would look great in any room in the house. This is for the Double Panel, which has blazing hot heat outputs. For the slimline single panel click here.